Although it is sometimes difficult to confront one’s own mortality, it is in your family’s best interests to start your estate planning early in life. 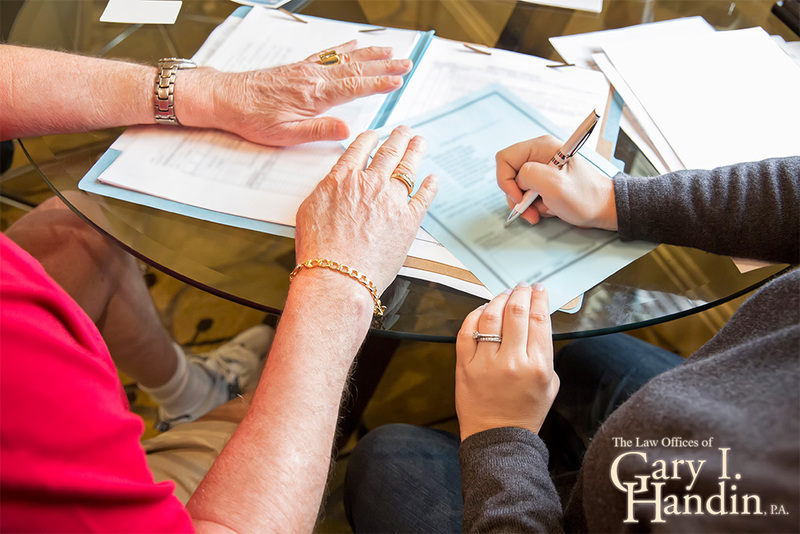 At Gary I. Handin, PA., we have years of experience in estate planning. Our expertise includes setting up trusts, drafting wills, providing representation during probate proceedings, preparing durable Powers of Attorney, and coordinating the appointment of health care surrogates. We have a professional, dedicated team of estate planning lawyers who are renowned for their attention to detail and sound advice on all estate planning related matters. Living trusts are trusts that are created during the lifetime of the Grantor or Settlor (the creator of the Trust), into which the Grantor’s assets are placed. Upon the passing of the Grantor, the successor or .co-trustee (often a spouse) or successor trustee will distribute the trust assets to the trust beneficiaries as per the terms of the trust. Living trusts are an excellent way to avoid probate proceedings and avoid legal fees and expenses if they are properly drawn up and administered. While living trusts are very useful, trust law is complex and so is the process of setting up an effective living trust. At Gary I. Handin, P.A., our estate planning lawyers regularly create living trusts for clients, and have detailed knowledge of the legal process which needs to be followed to set up a living trust which will achieve the goal of avoiding probate. We’ll register your living trust, ensure that it is tailored exactly to your needs, and prepare all the necessary documentation, giving you total peace of mind about the distribution of your assets once you have passed away. A living will is a legal document which captures your wishes regarding the medical treatment you want to receive should you become incapacitated through disease or an accident. In the event that you can no longer communicate yourself whether you wish to continue receiving medical treatment, a living will, will indicate the circumstances under which you want medical treatment to be withdrawn. Like any other testamentary document, a living will should be drawn up by your lawyer to ensure that it is valid and properly communicates your wishes. Our estate planning lawyers will ensure that your living will complies with all state requirements, that it clearly and precisely articulates your wishes, and that it covers all possible eventualities. Consult the offices of Gary I. Handin, PA., today if you would like to know more about the benefits of writing a living will. In the event that you become medically incapacitated, you will need a health care surrogate to make important decisions regarding your medical treatment on your behalf. It is preferable that you appoint your own health care surrogate while you are still of sound mind, instead of having a proxy allocated to you by law when you are already incapacitated. This will allow you to ensure that the surrogate who will be making important life choices on your behalf is aware of your wishes regarding medical treatment and is fully prepared to act in your best interests. The appointment of a health care surrogate requires compliance with a number of legal requirements, which is why it is vital to have your lawyer assist you through the process. The reliable, dedicated attorneys at Gary I. Handin, PA., are here to assist you throughout the appointment process and will give you all the legal advice you need to make an informed decision about your health care surrogate. At some point in your estate planning process, you will likely consider whether you wish to set up a trust for your heirs. Trusts may be revocable or irrevocable. Revocable trusts reserve your right to amend, revoke, or make additions to the trust during your lifetime. Irrevocable trusts, on the other hand, may not be changed or revoked from the time which they are made. It is important to obtain sound legal advice on the respective advantages and disadvantages of these two trust types before making a decision as to the type of trust you will create. Further, regardless of which trust type you choose to use, trusts are complex legal entities and require the expertise of an experienced lawyer to be effectively set up. Contact Gary I. Handin, P.A., for legal assistance in all trust-related matters. We are meticulous, reliable, and professional in all that we do and will ensure that any trust which you create is valid, binding, and captures your wishes exactly. Under Florida law, most estates must undergo probate proceedings upon the passing of the deceased. During probate proceedings, the Personal Representative of the estate must prove the will’s validity in court so that the deceased’s assets can be distributed to the chosen heirs. Probate can be an exhausting, expensive, and lengthy process, which is why it is best to hire a probate attorney to assist your family upon the passing of a loved one. We have an excellent team of probate lawyers who will ensure that your loved one’s estate is given outstanding legal representation during probate proceedings. Contact the offices of Gary I. Handin, P.A., today if your loved one’s estate is facing probate, and we will do our utmost to ensure a speedy, successful probate process for you and your family. Durable powers of attorney is a type of power of attorney which allows you, the principal, to appoint an ‘attorney-in-fact’ to manage all your legal, medical and financial affairs on your behalf whether you become incapacitated or not. The estate planning lawyer at Gary I. Handin, PA., will help you to validly prepare a durable power of attorney and will prepare the power of attorney to best suit your needs and interests.